Just on a month ago Sia Svendsen crossed the Godzone finishline at Kaiteriteri to take her biggest win. 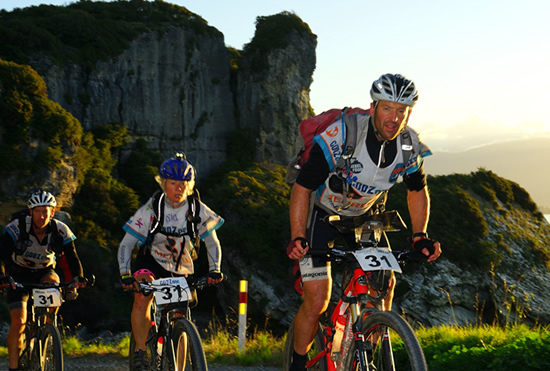 Sia shares her story how Team Yealands Family Wines won the Godzone Chapter Five after racing 530km traversing the NZ wilderness in 3 days and 14 hours. How did Team Yealands Family Wines come together? I had not been planning of forming a team for Godzone 2016 as most people I knew for a team were already in a team. I focused on having a fun summer with adventures, work and some chilling. Chris and Dan Busch both called me the same day end of January. I spoke to Chris first and said to him "please don't say this is a joke" . He sounded rather serious saying it wasn’t a joke and that it would be a fun race racing with the Dan’s. I didn’t really need to think twice. Who wouldn’t seize such an opportunity? I have raced with Chris before in an Arrow race alongside Ian Edmond many years ago and Chris was a machine then. What were the roles amongst the team? The roles of the team saw Dan Moore and Captain, plus the motivator- he did an amazing job with sponsorship from Yealand Family wines, Absolute Wilderness etc. Also he is a really caring and humbling guy who just loves an adventure with mates. Chris Forne (AR World Champion) - obviously the navigator but also took a leadership role before the race with the logistics of food and gear bin packing to minimize what we took with us to keep it simple and fast. Chris lead the navigating alongside Dan Moore who easily can keep up with Chris on foot. Chris has a great pace judgement once the race started which he executed exceptional well. I have heard that some may view Chris as the quiet one but would say he is quite the opposite in this race anyway. Bubbly, joking and pulling faces all the time and the Dans always asking teams about their feelings. Dan Busch is not only an amazing paddler but very caring and supportive person who always keep by your side. He is like a guardian angel. The boys all worked so well together and never seemed to get down or stressed. All three are strong with a lot of horse power. I adapted to the chatter box theme and making sure we hadn't forgotten any compulsory gear in the transitions. Racing highlights over the years included Godzone 2016, Redbull Defiance 2014, 2016 with Floortje Grimmet/Joanna Williams. Life gives most people a testing time at some stage. Mine has been, and at that stage you can't try and be a hero at everything and it can be hard to do it alone. However I have learnt and grown a lot from lots of failures and illness that hopefully is now past. Might have changed me but I still have the smile. What was your Godzone race plan? Our expectations were to race smart and have fun- lots of laughs. First impressions on seeing the 2016 Godzone course? We didn't speculate on the course too much besides it looked like a scenic course with a few good nav choices, according to Chris, some easier biking legs with no hike a bike and some exciting and rewarding paddle legs. Not the hardest course but a fun and rewarding one for all teams. We had a good team chat the night before the race as none of us had raced as a team we had lots of unknowns that we would only figure out as we raced along and only can improve on if we are lucky to race as a team again. However a team chat is important to verbalise what each member is thinking about the race and team. I was quite nervous mainly because some media had put a cloud on whether I could keep up with these boys. The boys pretty much just replied "we just want you to be Sia- no one else". When you have limited time to get ready for such a team it’s natural to worry about fitness and it was good to find out that Dan Moore was thinking the same. He is building a house along with Jody- his daughter being born so life had been busy with much less training than previous years. Dan Busch on the other hand seemed raring to go and was just so ready, having benefited well with a training programme from Trevor Voyce. Chris is just slightly above human. Chris was keen for us to take it easy the first few stages and ease into it, mingling with teams and then move steadily on the first trek which always tends to split teams quickly. We had planned on a couple of good sleeps of around 3 hours depending on how we were feeling and if we made the dark zone. Then Chris was keen for the team to move faster on the 2nd half of the race which we would be around Mt Owen trek. I was so nervous prior to the start so I was happy knowing we could just let teams run off and hopefully pass them later on. The coasteering I felt pretty weak - mostly due to nerves and the chaos. Chris and I both got bad cuts. Chris on the hand as he had kindly lent me his gloves and me on the knee when washed off a cliff. Chris' hand didn't look too flash but he solidered on and we get in the kayaks around 6th place or so. We quickly settled into a good rhythm - eating and chatting as we passed teams with view to only two teams- Swordfox and Torpedo7. Some exciting fun surf landing sees us into TA in 3rd place. Swordfox is looking super focused and a team with some incredible strength, experience and greatness all round and could have been either team for the win. When did you know you had the lead? We only knew of our lead when we came to the end of the Red Hills trek. Chris didn't know if his route choice would pay off. He had a bad fall and Dan Moore took the map for a short while and Chris came right quickly though. The team would stop regularly to look after the feet also- few minutes to apply some anti chafe/ gurney goo.. 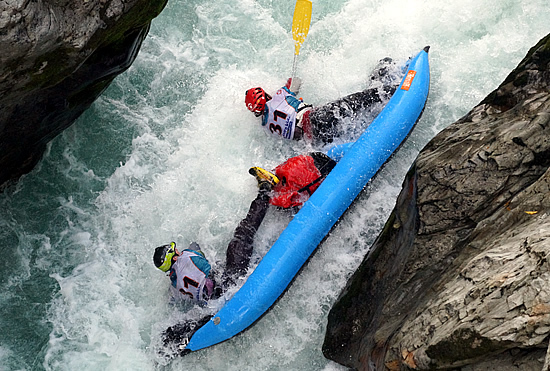 The rafting split the race for the podium, how did you see the rafting and darkzone? We only focused on ourselves throughout the race. Coming off the 2nd trek we had had a 2 hour sleep despite it was not ideal as we were very cold but we felt better after this. We had chosen an exciting route choice which proved to have a lot of wind fall so wasn't that easy- in fact quite horrible but oh well that is how it goes, bit of fun. We came off the trek early morning to get on the river around 8am. Dan and Chris had issues with their canoe and had to run back to change it. We settled in, eating and recovering. Not worrying about other teams. We knew how strong Swordfox was in every discipline but we could only control what we do and keep our race plan race smart and with fun. It was however really cold in the raft and finally we did get to see the sun. How did the notorious Horse Rapid go for the team? We were quite enjoying the river until we noticed people on the bridge and a volunteer who tried to say something about the Horse rapid. However he was so close to the rapid we could hear nothing and just had to go for it. Dan Busch said something about us taking the wrong line but we were already committed. Next second we are flipped and gear is everywhere. Chris and Dan had an attempt at the following rapid and get dumped again so Dan and I decide to portage but we are still searching for our dry bag with our packs and the tracker. It appeared after quite some time. We have also a broken shaft on one paddle so once we are finally back in the canoe I take the broken paddle and Dan Moore gets mine. We would like to run it again though now we know what it is like. A bit of adrenalin was fun, despite at the time I was really cold along with all my team mates. Dan Busch and I got our canoe wrapped around a rock on the lower section also and it took some time to get it out and then we swam the rapid. Dan never stresses and his calm persona was really comforting for me as I probably just had to take a few extra breaths. Bushy just said all part of an adventure journey. However horse rapid got me a new friend in Pernille a Danish girl who was on the rescue team and also girl friend of top white water kayaker Ben Jackson. When did you feel you had the win in hand? The win is never won until you have crossed the finish line. So much can happen that if you get too overconfident things can easily go wrong. We agreed to sleep for about 3-4hours at Granity hut on the Mt Owen trek. After that we would try and execute our race plan about going up a gear to the finish. Chris felt sleepy on our mtb ride to Mt Owen so he said “I need 5 min power nap”. We just jumped off our bikes once off the highway and slept 5min. We transitioned to the Mt Owen trek and spent the climb to refuel so we were a little surprised hearing that we had done the climb in a good time. Chris shared his yummy smoked salmon with us while the boys ate a few absolute wilderness meals as well while climbing. I felt really great but Chris is really on to the pace, just cruise- not too hard. It was really cool and fun around the rocks even in the dark. Once we reached the hut we decide on our long sleep knowing that Swordfox could pass us during that time as we had no idea how far or short they were behind us. My compulsory gear was wet from the river so Bushy gave me his fleece and keep close so I didn't get cold despite the hut is warm. Chris and I are awake after 2.5 hours and keen to go probably. Chris asked the team if we want to go but we decide to stay the planned time. Once the 4 hours were up we set off and when we hit the ridge we see the lights of Swordfox behind us. We estimate maybe they are 45-55min behind- maybe it was closer. We all feel great and see a beautiful sunrise and we set off with renewed energy. We absolute loved the stunning scenery and vegetation. A moment that I will treasure for a while. The boys all feeling strong so I move my shorter legs as quick as I can while Dan Moore feeds me an absolute wilderness porridge on the go. It was quite funny. On the way down to TA we see the gorgeous sporty girls of Nelson. They all cheering us on while waiting for Swordfox. With a mixed bag of results over the years how did victory at Godzone feel? We were super cautious not to do something stupid- so once on the Rameka track we would take it super easy not to crash and go easy downhills. Once we paddled into Kaiteriteri Beach and the realisation that Chapter 5 Godzone 2016 was ours it was almost too good to be true. Dreams do come true. I am stoked to have shared it with three guys, I couldn't speak more highly about- lovely strong and humbling people. They gave me confidence, hugs and laughter. 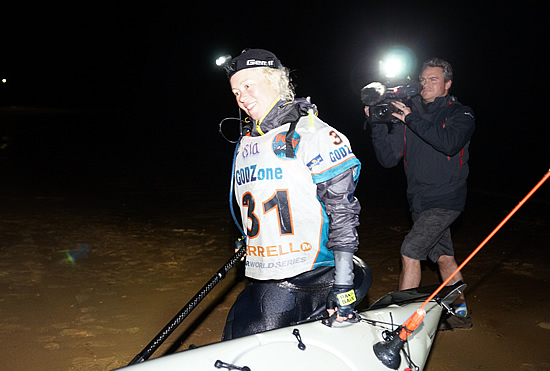 We all felt great at the finish having had a fun last paddle with a massive bright shooting star. Some locals who followed us for a bit in their boat and gave us hot drinks. Bushy was keen for a wee sprint against Dan and Chris but forgot who won that sprint. Anyway a race that never felt too hard but that is mostly a reflection of the team work I think. To do well and to win- well Seagate would know in this sport. We were all keen to learn a bit off Chris. To do well in a team I think leadership is key. A strong leader who demonstrates integrity and competence. Someone people trust and they can inspire others/ team mates to embrace the race goal/vision and their own potential. A leader is someone people want to follow- look at Nathan. Your team has a common goal and challenge is to set a strong common goal that brings you together with the above leadership. Team should also support risk taking as sometimes you gamble route choices, skills etc. It maximizes your potential within the team and having all 100% to one another for the journey- you also encouraged to grow and stretch your own limits..
What was your race nutrition plan? We didn't have much food in our transition boxes as they were too heavy and we were too fast for the yummy Absolute Wilderness Bolognese at the end of lake Rotorua that we were happy with our Absolute Wilderness meals in our packs along with Awaken and Em's power bars and other few goodies of sweet and savoury’s. We did escape for a few pies but not 6 as we read. We’re not so sure about the pie hunt theme. What were people’s reaction to your win? Pretty overwhelmed with people's support after the race. You have no idea what's going on besides the wonderful support from the locals and friends on the course. That was so warming and motivating, Reading everyone messages gave me a few tears for sure. Thank you seems hardly enough. Even people wanting a few selfies feel beyond anything I have experienced. Thank you to Ritchie/Team Cure kids for giving Godzone that extra lift. Thanks to Yealands Family Wines for believing in us enough to sponsor us for this year's race. Thanks to the friends who went and bought Yealands wine afterwards too. To me personally I would also thank you Nat and Kristina Anglem, Nathan Fa’avae, Emily Miazga and Ian Edmond for giving me a few motivation quotes before and after the race. 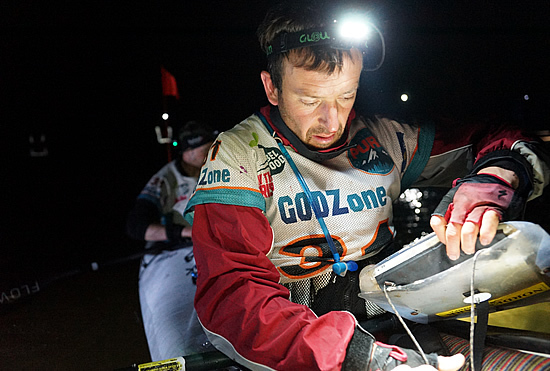 The Godzone team of everyone involved made this Chapter a hard one to beat. A fun and enjoyable course that we could only have wished to have seen more daylight during the trekking stages.